For centuries artists have explored strange perspectives, convoluted viewing devices, and utilized various tricks to tease and enchant the viewer. 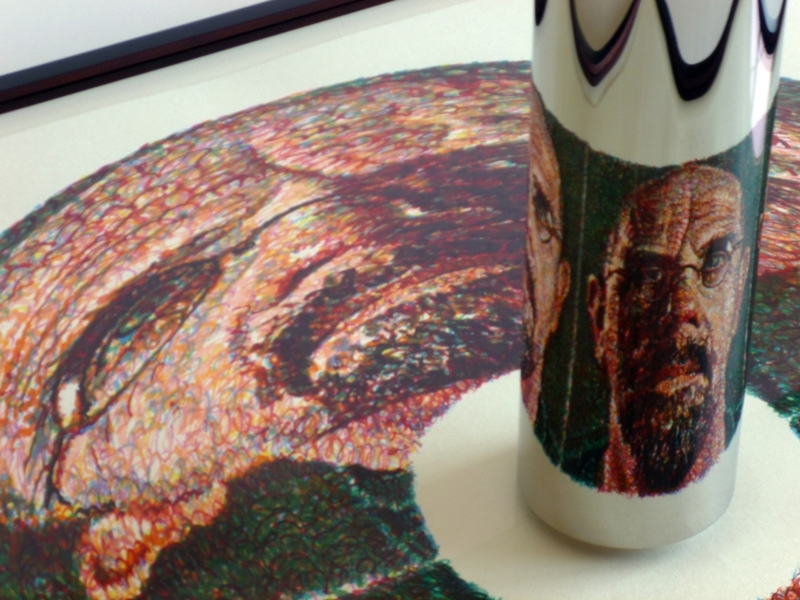 New York artist Chuck Close has adopted one strand of that tradition, anamorphic drawing, in a few recent portraits—the images are distorted beyond recognition on the flat page but magically appear clear when viewed in the reflection of a mirrored cylinder. Enter A Street Frames; we had to find a good way to frame one of his works and show it to full advantage when a Boston-area collector brought in a Close self portrait (silkscreen on Japanese paper) to our Cambridge shop. The publisher provided a simple base and platform for the print and its mirror but our client was looking for something that would harmonize better with the space where he intended to display it as well as offer more protection, all without obscuring the optical illusion and transformation of the image. We built a custom-milled frame, in cherry finish, to complement his furniture, glazed it with Optium Museum acrylic, and designed special supports for the stainless steel cylinder in the center. This isn’t the most elaborate or flashy special project we’ve ever made, but it shows another side of custom framing. We carefully calibrated the milling and finish of the frame to be as restrained and subtle as possible so nothing competes with the art. At the same time we added critical protection to a valuable piece and gave it the right style for its new home. If you’re interested in the various kinds of perspective artists have discovered and devised over the years, view this timeline from The Getty. 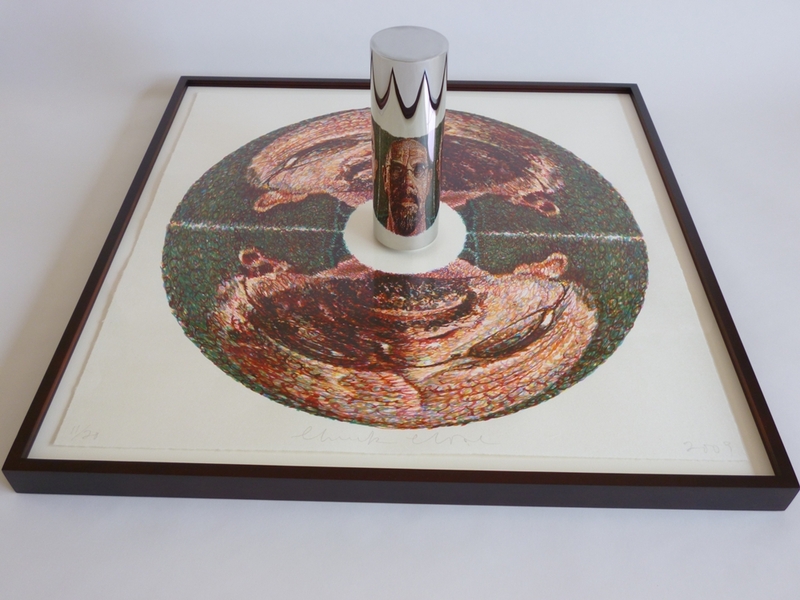 For more prints by Chuck Close and others, see Two Palms Press.